Abdus Salam Sheikh is one of 4.3 million people in Bangladesh without access to safe drinking water. 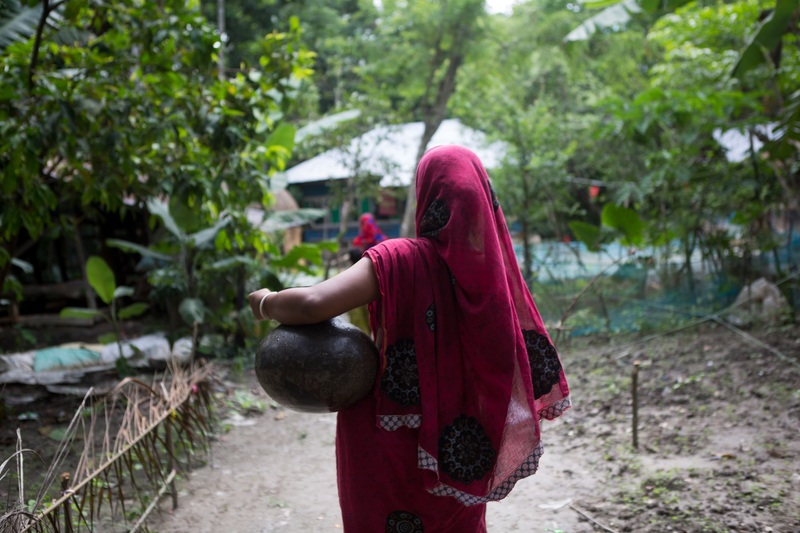 The 58-year-old man lives alone with his wife in a remote village in Mongla of Bagherhat in south-western Bangladesh. 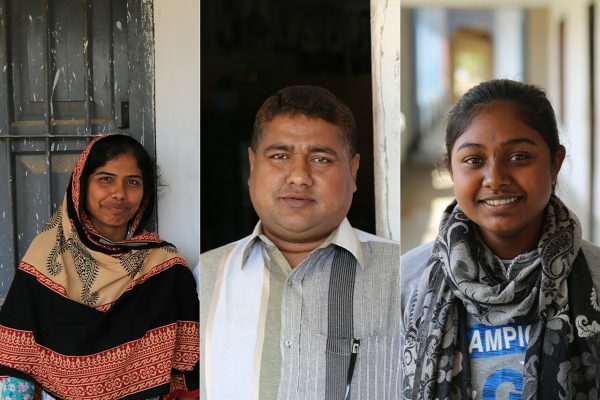 Salam speaks up about the many years he spent in the struggle of collecting water, stressing on how he did not want his children to live there – an area where the water crisis governs their lives. Apart from arsenic and salinity in water, pond water riddled with pathogens has already caused many episodes of diseases in his family. 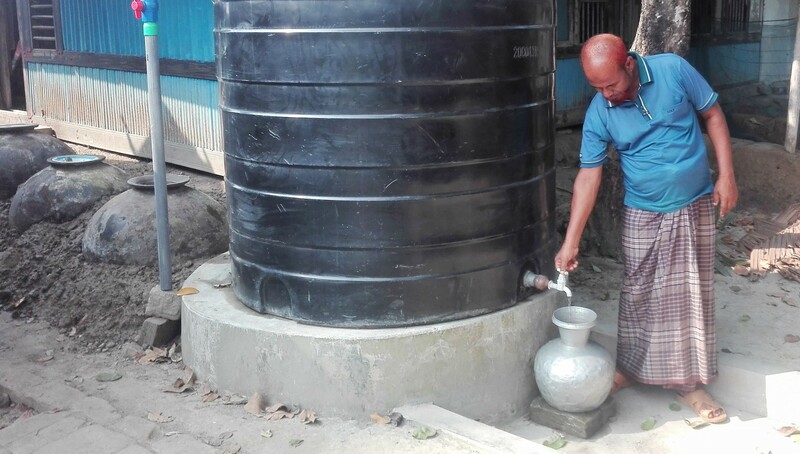 Lack of potable water is not new to the residents of Mongla. In fact thousands, mainly women, have been following the monotonous routine of queuing up for water for drinking and cooking. The second busiest port of the country, is one of many areas of southwest Bangladesh where fresh water aquifers have been intruded by seawater, causing extreme salinity in groundwater. This means pumping groundwater would only yield salty, arsenic contaminated water, and thus deep tube wells are not a viable solution. During periods of water scarcity, people would collect pond water to meet their needs. 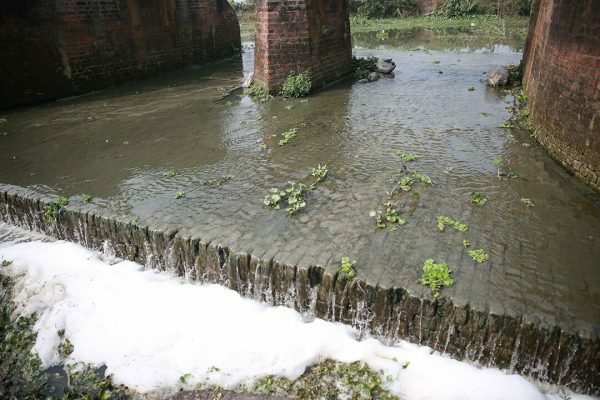 However, frequent storms and massive disasters, such as cyclone Aila in 2009, caused cross contamination in pond and sea water, making surface water salty as well. The World Health Organization (WHO) estimates that four out of five cases of child mortality in the areas are related to contaminated drinking water. High salt intake through water can cause hypertensive disorders, and can be especially crucial for pregnant women who develop the risk for preeclampsia- a major cause of maternal mortality globally. Rainwater harvesting is an age-old concept that has easily made its way to the list of mainstream technologies. Rain that trickles from the roof of houses are channeled through pipes to pour into a reservoir – a scalable solution for areas with water crisis. “The water from the reservoir lasts us up to nine months in a year. If I can save up some money, I would like to buy another reservoir to ensure safe drinking water throughout the year”. Abdus Salam Sheikh with a large reservoir to store water from his rainwater harvesting system. 2.1 billion people across the world lack access to safe drinking water, and according to The World Water Development Report released this year, nearly 5 billion of the global population will suffer from water shortages by 2050. To meet the emerging challenges, the UN stresses on nature-based solutions such as rainwater recycling and forest regeneration to better manage water for the future. Rainwater harvesting systems can be used to combat more than just water scarcity. It establishes a culture of water preservation, storage and efficient use. At a larger scale, it strengthens the urban water cycle management by reducing stormwater runoffs, flooding and contamination of surface water, while aiding to restore groundwater- all of which can collectively reduce climate-related disasters. As we enter the era of unprecedented water scarcity, now is the time to go back to our roots and adopt indigenous ways to extract resources from our ecosystem. Zarfisha Alam is a senior sector specialist for BRAC’s water, sanitation and hygiene programme.